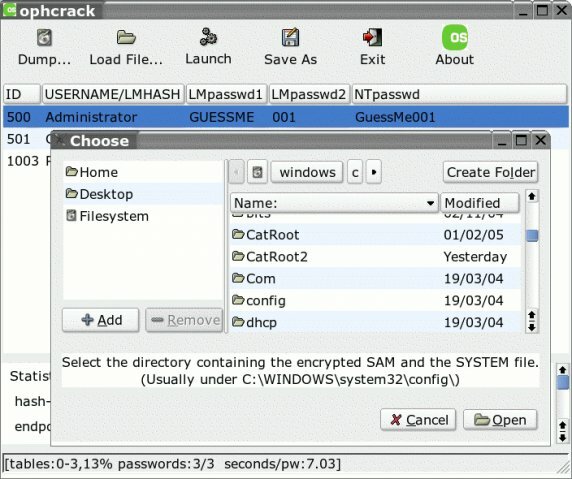 The free, open source Ophcrack Live CD is a Windows program used to crack Windows passwords. It’s a simple Windows password cracking tool designed to help you recover lost Windows passwords. After you download the 462mb .iso and burn it to a CD, just restart your computer and boot up the Live CD. Once the CD boots, blamo… Ophcrack automatically loads and is on its way to letting you crack Windows passwords. I’ve yet to try this live bootable version, but I used l0phtcrack (now LC5 and no longer produced since the company that made it was bought by Symantec) a few years ago to crack Windows passwords and retrieved 99% of the passwords off a backup domain controller in something like 12 hours (using a not-so-powerful desktop to do the cracking). Get ophcrack Live CD. FYI – you can still get l0phtcrack (aka LC5) from mirrors like sectools.org. A couple people have asked if this really works. I just want to re-iterate that this DOES work to crack Windows passwords. It requires physical access to the machine, but if you have physical access you can literally crack every Windows passwords on a machine in a very short time. As I said above, I used it on a backup domain controller and in about 12 hours cracked every single password on the BDC. Why crack passwords when you can just create a new Admin account? Long time ago , I was confronted with the similar problem. Finally , my friend Jane introduce the Windows password Reset.It help me access windows. It’s great! Great ,thanks for Windows Password Recovery Tool 3.0, I solved my problem with the help of it. 4.After launched the CD, a window pop up with all your account names(if you have several accounts); select one of the accounts that you have forgotten its password to reset it. Just one press, you have removed the password. I recommend a new tool windows password reset 7.0. It also support windows 7 password reset . It’s great. one second is done. A few days ago, I had met the headache things that I had forgotten Windows login password. The login screen rejected my passwords. I was frustrated because there was very important data on my disk and I couldn’t reinstall the OS. …………. However, I fortunately got to know the Windows Password Unlocker, which is a professional windows password recovery tool for us to reset windows 7 password instantly yet no data loss. Ophcrack Live CD is very good but it doesn’t have GUI interface. I know a simple way to reset windows password to blank when you forgot windows administrator password,it need not to reinstall windows OS,and wont loss any data,by using “Reset Windows Password 1.3”. I have recently bought a second-hand computer from a store. But when it starts up, it requires me to type the administrator password, and it makes me quite disappointed!